The next 20 years will not be a simple extension of the previous 20 years. Everything that is currently seen as permanent--the Savior State, the financialized economy, cheap energy-- is visibly unsustainable. Status Quo personal finance strategies--"buy and hold" and global diversification--are doomed by their reliance on increasingly unstable global markets and a myopic focus on the rearview mirror--the recent past is no longer an accurate guide to the future. Uniquely troubled times require an unconventional understanding and "tool kit" of investment strategies. This comprehensive guide offers practical ideas for everyone, from those seeking to protect 401Ks or IRAs to entrepreneurs to those with more time than money to invest in their future. This book offers a broad spectrum of strategies for investing your human, social and financial capital in low-risk, decentralized, diversified assets that increase resiliency and self-reliance. Topics include systemic risk, the spectrum of potential investments, gold, hedging, relative value, hybrid work, income streams, ecosystems of local enterprise and the essential tools of lower-risk investing. Read the Introduction (below) and Chapter One. As I write this in mid-2011, the financial world seems remarkably resilient: global markets have shrugged off oil climbing above $100 per barrel, chain-reaction rebellions in North Africa and the Mideast, a devastating earthquake and tsunami in northeast Japan, rising food and energy costs, a sovereign debt crisis in Europe and a decline in the U.S. dollar to multi-year lows. Despite these systemic risks, the U.S. stock markets have climbed back to their 2008 pre-financial crisis levels. The mainstream financial media is again touting reasons why stocks will continue rising: the recovery is now self-sustaining, inflation remains low, corporate profits, already at record levels, will keep levitating higher, and the Federal Reserve has pledged to keep interest rates near zero indefinitely. “Don’t fight the Fed” has entered the investment lexicon as an iron law of nature akin to gravity. The Fed’s quantitative easing policy, designed to lower the U.S. dollar and ignite inflation, has richly rewarded buyers of risk assets such as stocks and commodities. With the market up over 100% since the March 2009 lows and corporate profits exceeding pre-crisis levels, the sky is once again the limit. Financial authorities routinely present projections out to 2030 and beyond, confident that government budgets and global markets will remain stable for decades to come. It’s truly as if the 2008 global financial crisis never happened. All is right with the world once again. Indeed, the market’s “discounting of bad news” seems like a replay of the Bull Markets of 1987, 1997 and 2007. But behind this façade of recovery, the fundamental dynamics have changed. The financial firestorm of 2008 that was apparently extinguished by unprecedented central bank interventions is still smoldering. Only the amount of deadwood—the excesses of risk, debt and leverage that led to near-collapse in 2008—have piled even higher. The monetary and fiscal “fixes” imposed by authorities around the globe since 2008 didn’t reduce the global financial system’s instability, they merely suppressed outward signs of instability. Beneath this tranquil surface, the “fixes” have greatly increased the global financial system’s instability. Like an apparently peaceful forest filled with dry deadwood, a single spark can ignite a new firestorm that will burn with greater ferocity and speed than the financial fire of 2008. This instability is beyond the reach of the regulatory “medicine” that has been offered as a cure; it is systemic, the consequence of profound structural imbalances in global demographics, resource consumption, debt, leverage, risk and governance. Behind the facade, the world’s financial systems are increasingly precarious, as a key feature of systemic instability is that small, unpredictable fluctuations can trigger outsized consequences. This instability naturally creates anxiety and fear, as we all have much to lose in the next financial firestorm. We fear what we don’t understand. This book is based on a simple but profound idea: that the best way to conquer fear and anxiety is to understand the world’s financial instability at the deepest levels. Understanding is empowering. To this end, the book presents a great many ideas, some of which may be familiar to you and some which may be unfamiliar. Since we learn by having ideas presented in different forms, the book will occasionally test the patience of those readers to whom this is all familiar. The acceleration of change in our digitized world has shortened investment timelines down to months or weeks for investors and minutes or seconds for high-frequency trading machines. This compression of time has made us impatient for answers. The trends and dynamics described in this book will take years to fully play out, so a longer view is required. When we face risk, complacency and false hope are great dangers. To believe that the Status Quo will endure without any real changes being needed is a false hope. This book offers an alternative perspective, one that views troubled times as a great opportunity for those prepared for change. Our ideas of capital and wealth will be challenged, but in a positive way. In this sense, I believe this book will be inspirational to all who prefer the truth to complacency and false hope. In an analogy many of us can relate to, this choice is similar to a doctor’s diagnosis and treatment options for a chronic disease: do we want empty reassurances that “everything will be fine,” when we know in our bones that everything is not at all fine, or do we want the plain truth, including the uncertainties that come with a realistic assessment? Reassurances and complacency appeal to our desire for normalcy, but deep down we know we cannot possibly get better without hearing the truth about our condition and the pros and cons of various treatment options. Only when we know these can we take charge of our own lives and destinies. 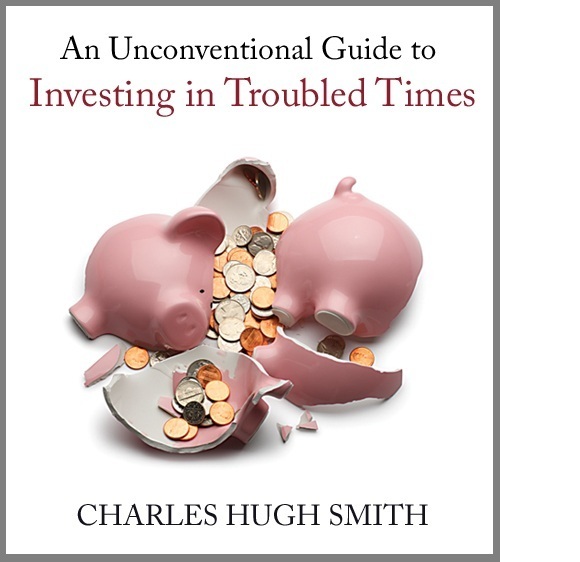 Read Chapter One of An Unconventional Guide to Investing in Troubled Times.